Hi pretties! So sorry for the delay in this post! I’ve had the craziest week and have had a lot on my plate. Right now, I’m hungry (and have no food in my house as usual…I promise I’ll become domesticated ONE day haha), delirious with fatigue and still thinking about the 8 million things that I need to get done next week at work. Luckily, it’s my birthday weekend (woo hoo!) so I can relax and kick back a bit. Alright, here’s what happened the day I got a Brazilian Hair Straightening treatment. As you know from my previous post, I headed over to the Rita Hazan Salon on 5th Ave to see my hair colorist/love of my life Adrian Wallace (that’s him right there!). Before he could even start, I grabbed his hand and was like, “Adrian, are you sure my hair isn’t going to fall out? !” Everyone in the salon laughed at me like what is this girl talking about?! Although it was kinda embarrassing to have them all laughing at me, it was still pretty funny. One of the assistants (the one pictured below with the long black hair that’s putting in my treatment; I love her and can’t even remember her name! ; turns out that she also get the brazilian hair straightening treatment as well and her hair always looks amazing) took me over to the bowl and washed my hair three times. Then, they dried my hair with a blow dryer. Next, she (along with Adrian and another assistant) began to put in the treatment. (Or, as my other fave assistant there Susana calls it “that purple stuff” hahaha) I was reading a magazine the whole time and felt no burning or pain. 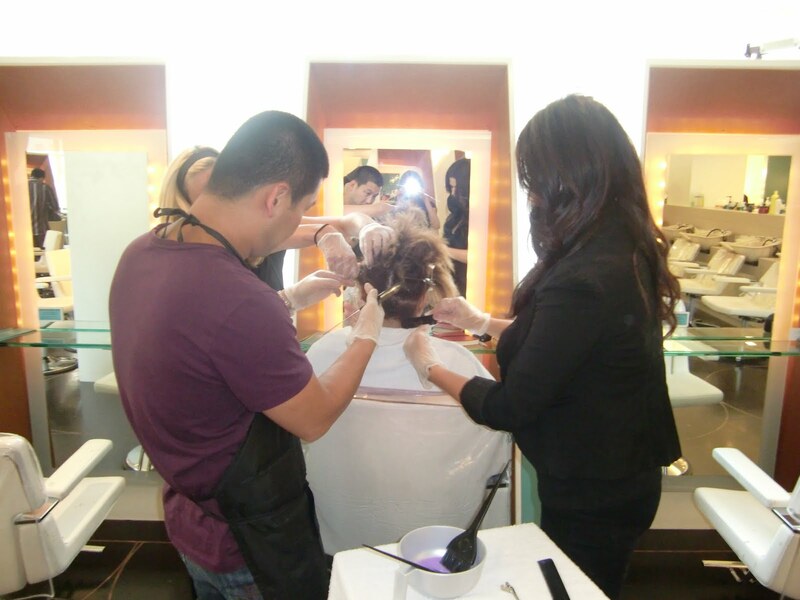 Don’t worry, the formula was keratin based and formaldehyde free! Adrian said he tried the “illegal stuff” once on the owner Rita’s hair and it was horrible. Afterwards, I was given a blow out with a round brush and a blow dryer. The last step was just for me to sit and get my hair flat ironed. Piece by piece. This was the only tedious part of the process. 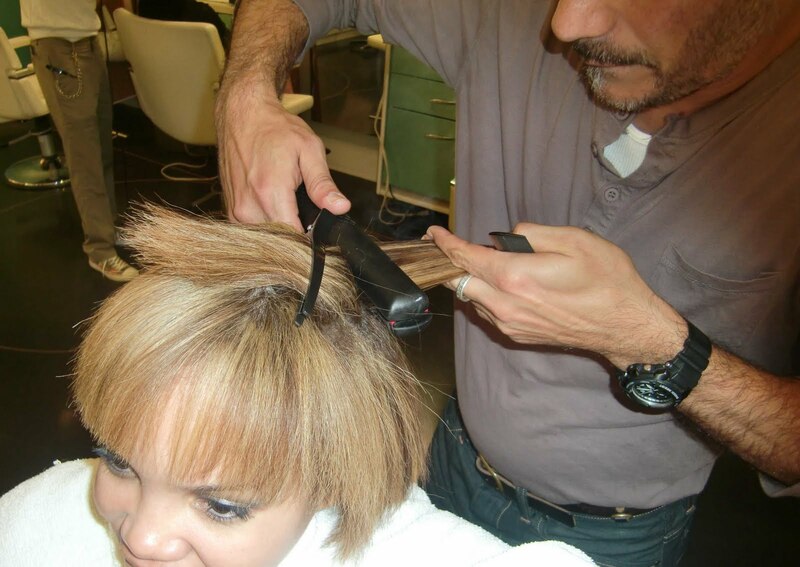 Adrian said the heat from the flat iron is what sets the treatment in best. And voila! Just like that, I now have super straight hair that moves with the wind and doesn’t frizz up. I LOVE it!! It’s changed my life. Now you’re probably wondering why I just don’t go and get a perm. I got a perm once and let’s just say that my hair didn’t like it because chunks of it fell out. That was in college; and I’ve never messed with it since. I’d always just stick to hair color. Even though my hair texture is very fine and pretty easy to straighten, it’s the frizzy part that I always would hate…ugh. I had the opportunity to see the Chris Rock documentary last week “Good Hair” and I thought maybe this would change my mind about getting the Brazilian, but it didn’t. If anything, I thought of this as a spoof on black women and their pursuit of what they deem as “good hair” (ie the perms and weaves). It WAS funny at times, but I didn’t take it very seriously…and don’t think anyone else that sees it will either. (Do let us know what you think of it after watching!) I’m an adamant believer that you should do whatever fits you with your hair; and this idea transcends to all races. If you wanna shave your head, dye it hot pink, grow it down your back or rock a ‘fro, do it! I love to change up my hair look (be it with weaves, wigs, hair color, etc) and do so freely on a month-to-month basis. 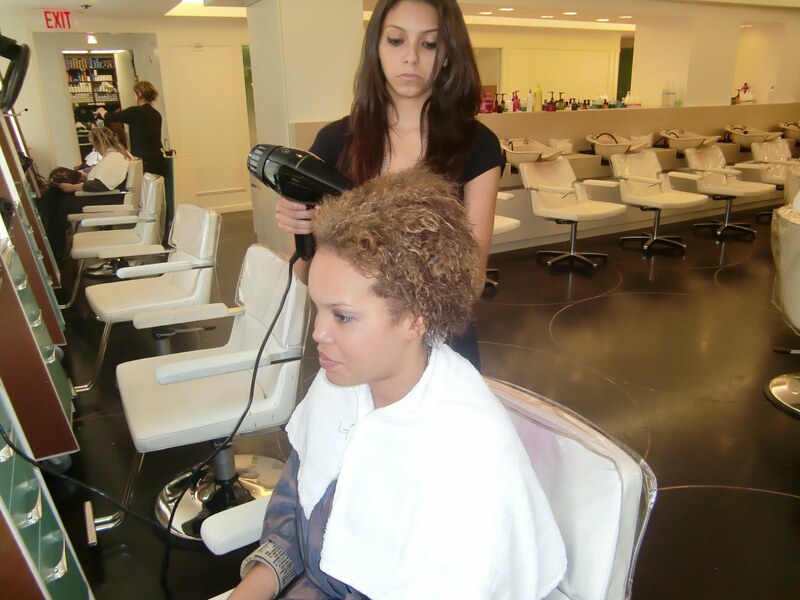 After you get the treatment, you can’t wash your hair, put it into a ponytail, sweat in it or curl it for 3 days. The only thing that you can do is flat iron it. I also have to use a special shampoo, Barex ColourLife Shampoo. When I wet my hair, Adrian says that it will still curl up, but the curls will be more like waves and easier to manage. Below are some pics of the process…enjoy! And let me know what you think.